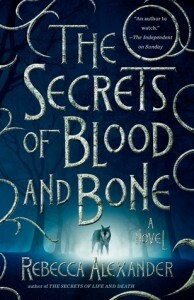 The Secrets of Blood and Bone is a fun addition to the urban fantasy genre and an great follow up to the first in the series, The Secrets of Life and Death. In fact, I'd even say I liked it more than the first. Alexander has fine-tuned her style and the alternating historical/modern story lines kept a more even pace this time around. In the first installment, I found myself growing bored with Kelley and Dee. The tempos of the parallel stories were uneven and every time I got into the story, I was pulled back out. This time, though, Kelley's adventures in Venice were a more even match for Jack's standoff with the Dannicks - a prestigious family with a nefarious history. This sequel has just the right amount of intrigue and action. My only qualms with it are that the characters aren't super complex and the dialogue between Jack and Felix is pretty repetitive. Did you know that Felix is worried because Jack is acting 'different' and doesn't think Sadie should drink blood because we don't know the side effects yet? You will be reminded of these facts approximately every 25 pages. But, as someone who grew up hooked on all things magic...I'm a total sucker for some witchcraft. I eat it up and this series is feeding right into it. I wanna go live in that cottage and be a garden witch and learn Latin and look after my wolf-dog and have a showdown with some dark magic maniacs. If a book leaves you feeling like you're either in the action or want to be in the action, then it's doing its job. Sigh...I guess I'll just have to wait for the next one in the series to come out (there's gonna be a next one, right?) so I can continue living vicariously through Jack, Sadie, and Maggie.